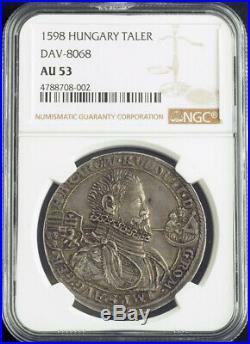 Mint Year: 1598 Denomination: Thaler Condition. Certified and graded as AU-55! Mint Place: Nagybanbya (today´s Alba Iulia in Romania) Reference: Davenport 8068, Huszar 1036 R8! Ruler: Rudolph II (after 1576, as Emperor of the German Nations). Weight: 28.44gm Diameter: 42mm Material: Silver. Obverse: Bare draped and armored bust with high collar right. Large coat-of-Arms of Hungary to left and the Virgin with baby-Jesus child within crescent to right. (crowned shield with arms of Hungary) H.
Rudolph II, by the grace of God, Emperor of the Romans, Ever Augustus, King of Germany, Hungary, and Bohemia. " 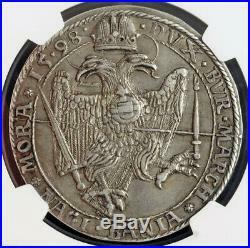 Reverse: Crown above large double-headed "walking eagle with cross-topped orb at chest. Sword and scepter in claws. Archduke of Austria, Duke of Burgundy, Margrave of Moravia, 1598. Astrology and alchemy were mainstream science in Renaissance Prague, and Rudolf was a firm devotee of both. His lifelong quest was to find the Philosopher's Stone and Rudolf spared no expense in bringing Europe's best alchemists to court, such as Edward Kelley and John Dee. Rudolf even performed his own experiments in a private alchemy laboratory. When Rudolf was a prince, Nostradamus prepared a horoscope which was dedicated to him as'Prince and King'. Rudolf gave Prague a mystical reputation that persists in part to this day, with Alchemists' Alley on the grounds of Prague Castle a popular visiting place. He was a member of the Habsburg family. Rudolf's legacy has traditionally been viewed in three ways: an ineffectual ruler whose mistakes led directly to the Thirty Years' War; a great patron of Renaissance art; and a devotee of occult arts and learning which helped seed the scientific revolution. Rudolf was born in Vienna on July 18, 1552. He was the eldest son and successor of Maximilian II, Holy Roman Emperor, King of Bohemia, and King of Hungary; his mother was Maria of Spain, a daughter of Charles V and Isabella of Portugal. After his return to Vienna, his father was concerned about Rudolf's aloof and stiff manner, typical of the more conservative Spanish court, rather than the more relaxed and open Austrian court; but his Spanish mother saw in him courtliness and refinement. Rudolf would remain for the rest of his life reserved, secretive, and largely a homebody who did not like to travel or even partake in the daily affairs of state. He was more intrigued by occult learning such as astrology and alchemy, which was mainstream in the Renaissance period, and had a wide variety of personal hobbies such as horses, clocks, collecting rarities, and being a patron of the arts. He suffered from periodic bouts of "melancholy" (depression), which was common in the Habsburg line. These became worse with age, and were manifested by a withdrawal from the world and its affairs into his private interests. Rudolf never married, and it has been claimed that he was a homosexual. During his periods of self-imposed isolation, he reportedly had affairs with his court chamberlain, Wolfgang von Rumpf, and a series of valets, one of whom, Philip Lang, ruled him for years and was as a result hated by those seeking favor with the emperor. Others, however, claim more conventionally that Rudolph had many mistresses and children with a retinue of'imperial women'. Historians have traditionally blamed Rudolf's preoccupation with the arts, occult sciences, and other personal interests as the reason for the political disasters of his reign. More recently historians have re-evaluated this view and see his patronage of the arts and occult sciences as a triumph and key part of the Renaissance, while his political failures are seen as a legitimate attempt to create a unified Christian empire, which was undermined by the realities of religious, political and intellectual disintegrations of the time. Although raised in his uncle's Catholic court in Spain, Rudolf was tolerant of Protestantism and other religions including Judaism. He largely withdrew from Catholic observances, even in death denying last sacramental rites. He had little attachment to Protestants either, except as counter-weight to repressive Papal policies. He put his primary support behind conciliarists, irenicists and humanists. When the papacy instigated the Counter-Reformation, using agents sent to his court, Rudolf backed those who he thought were the most neutral in the debate, not taking a side or trying to effect restraint, thus leading to political chaos and threatening to provoke civil war. His conflict with the Ottoman Turks was the final cause of his undoing. Unwilling to compromise with the Turks, and stubbornly determined that he could unify all of Christendom with a new Crusade, he started a long and indecisive war with the Turks in 1593. This war lasted till 1606, and was known as "The Long War". By 1604 his Hungarian subjects were exhausted by the war and revolted, led by Stephen Bocskay. In 1605 Rudolf was forced by his other family members to cede control of Hungarian affairs to his younger brother Archduke Matthias. Matthias by 1606 forged a difficult peace with the Hungarian rebels (Peace of Vienna) and the Turks (Peace of Zsitvatorok). Rudolf was angry with his brother's concessions, which he saw as giving away too much in order to further Matthias' hold on power. So Rudolf prepared to start a new war with the Turks. But Matthias rallied support from the disaffected Hungarians and forced Rudolf to give up the crowns of Hungary, Austria, and Moravia to him. At the same time, seeing a moment of royal weakness, Bohemian Protestants demanded greater religious liberty, which Rudolf granted in the. However the Bohemians continued to press for further freedoms and Rudolf used his army to repress them. The Bohemian Protestants appealed to Matthias for help, whose army then held Rudolf prisoner in his castle in Prague, until 1611, when Rudolf was forced to cede the crown of Bohemia to his brother. Rudolf died in 1612, nine months after he had been stripped of all effective power by his younger brother, except the empty title of Holy Roman Emperor, which Matthias inherited five months later. In May 1618 at an event known as the Defenestration of Prague, the Protestant Bohemians, in defense of the rights granted them in the. 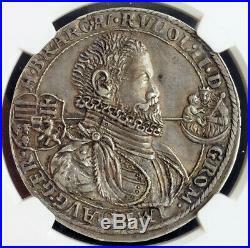 The item "1598, Hungary, Rudolph II. NGC AU-53" is in sale since Monday, March 4, 2019. 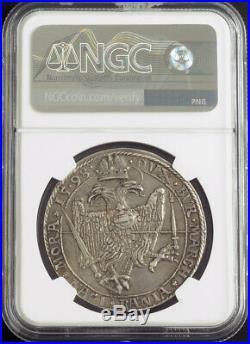 This item is in the category "Coins & Paper Money\Coins\ World\Europe\Hungary". The seller is "coinworldtv" and is located in Europe.